What started out as a 10-minute telescope lesson turned into something much more exciting, as a group of astronomy students at the University College London raced against encroaching cloud cover to document an amazing scientific discovery. On Tuesday night (Jan. 21), astronomer Steve Fossey was showing undergraduates how to use a telescope at the University of London Observatory when they spotted a star explosion in Messier 82, a nearby galaxy. Four students — Ben Cooke, Tom Wright, Matthew Wilde and Guy Pollack — picked M82 as their observation target. The galaxy, also called the Cigar Galaxy, is some 12 million light-years away and it is a popular target for small telescopes because it is bright and quite photogenic. On this particular night, M82 was also one of the few lights visible in a clear patch of the sky over London. Fossey noticed what looked like a star overlaid on the galaxy while he was adjusting the telescope. 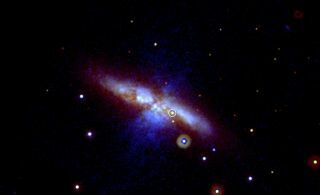 The team checked an online archive of M82 images and found that this object wasn't there before. With more clouds rolling in, the team rushed to capture a series of 1- and 2-minute exposures of the galaxy through different colored filters. They also set up another telescope to check that their sighting wasn't just an anomaly, according to UCL. The cosmic blast occurred when a white dwarf detonated some 12 million years ago — at a time when the human lineage Homo didn't exist yet and the Amazon River hadn't formed — but it is so far away that the light is just reaching Earth now. That said, it's also one of the closest star explosions to be observed in modern times. The supernova is perhaps only bested by the SN 1987A star explosion that suddenly appeared in the sky nearly three decades ago in the Large Magellanic Cloud, a satellite of the Milky Way, some 168,000 light-years from Earth. The discovery has been confirmed by the International Astronomical Union, which gave the supernova the official designation SN 2014J. The star explosion is expected to brighten through the first week of February; by then it might be visible with just a pair of binoculars. M82's new bright spot can actually be picked out in images of the galaxy taken up to a week before it was spotted by students at UCL, according to NASA officials. But since their exciting night, both professional astronomers in observatories and amateur astronomers in their backyards have pointed their telescopes at M82. Even NASA's Swift spacecraft turned its gaze to the star explosion, capturing images of the new supernova from its perch high above Earth in visible, near-ultraviolet and mid-ultraviolet wavelengths. "Finding and publicizing new supernova discoveries is often the weak link in obtaining rapid observations, but once we know about it, Swift frequently can observe a new object within hours," Neil Gehrels, the Swift mission's principal investigator at NASA's Goddard Space Flight Center in Greenbelt, Md., said in a statement. These Swift UVOT images show M82 before (top) and after the new supernova (bottom). The pre-explosion view combines data taken between 2007 and 2013. The view showing SN 2014J (circled) merges three exposures taken on Jan. 22, 2014. Mid-ultraviolet light is shown in blue, near-UV light in green, and visible light in red. The image is 17 arcminutes across, or slightly more than half the apparent diameter of a full moon. Early observations of SN 2014J indicate it is a Type Ia supernova — the kind astronomers use as "standard candles" to measure distances across the universe because they explode with astonishingly similar intrinsic brightness. (Careful study of Type Ia supernovas even led to the discovery that the expansion of the universe is accelerating.) Because M82 is filled with thick dust clouds, the supernova also gives astronomers the chance to study how interstellar dust affects the light of these standard candles, NASA officials said. The space agency has planned additional observations of the supernova with its other observatories, including the Hubble Space Telescope, the Chandra X-ray Observatory, the Nuclear Spectroscopic Telescope Array (or NuSTAR for short) and the Fermi Gamma-ray Space Telescope. It's possible that these spacecraft will find the first conclusive evidence of high-energy gamma rays and X-rays coming from a supernova, said Peter Brown, an astrophysicist at Texas A&M University who is using Swift to study supernovas.